Earlier today, I made a pretty simple and authentic Italian meal. We were gonna sit outside to enjoy the nice weather we had this afternoon but the heat was unbearable so we ended up moving back to the air-conditioned indoor. Perhaps, we should wait another couple of months to really consider sitting out. Back to my meal, it was my first time making focaccia and surprisingly, the result came out fantastic. I got this recipe from a blog called The Cookery Wife that was created by these two sisters from Texas and Oregon, Andrea & Hannah. I'm a huge fan of their Instagram feed. Their blog got a lot of pretty awesome recipes and many of them are quite easy to follow. I've been obsessed with making bread lately so I am collecting a bunch of bread recipes on Pinterest and trying out the simple ones for now. Once I get the hang of this whole dough making phenomena then I will try something a bit more challenging. ;) I think bread making is pretty phenomenal because all we need is just a few key ingredients to do the magic. Pretty much is just water, yeast and flour, given the right amount of time and quantity, knead a little here and there, toss the dough into the oven for a set time, and BAM! You got a beautiful loaf of bread right in front of you. That IS magic. This was inspired by The Cookery Wife's recipe. I used a little bit of garlic powder, fresh thyme and rosemary as topping. I baked it in my oven for about 15 minutes at 200ºC. Nothing beats a loaf of fresh homemade bread. Must try if you love to bake. I made the dough the night before and after rising, I place the dough in the fridge and bake it the next morning. Bring the chilled dough to room temperature before popping it into a preheated oven. 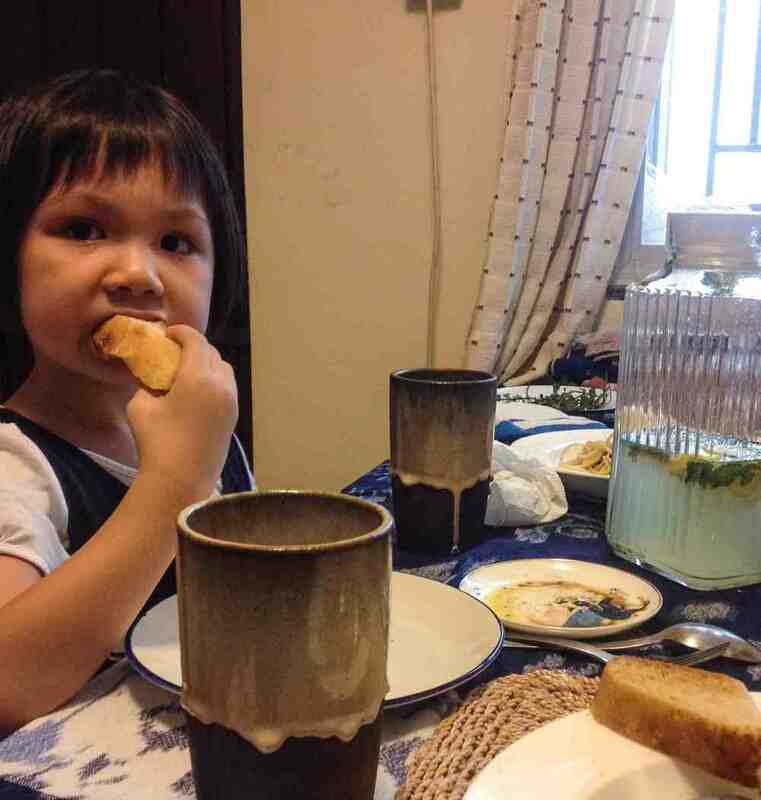 Alicia, my niece, is loving her bread. :) Such a satisfying moment. You can't get any simpler than a plate of aglio olio e peperoncino. Every family does it differently and here is our recipe. 1) Bring a pot of salted water to boil. Cook pasta according to its package label. 2) Preheat a frying pan with olive oil on medium low heat, add garlic, sage, anchovy, and chili, cook for 2 minutes. 3) Reduce to low heat and let the garlic and herb to cook slowly so the fragrant and flavor would kick off. This should take about 5-7 minutes and watch out for burning the garlic. 4) Add capers and cook for about 1-2 minutes. Add 1/4 cup of pasta water to the frying pan along with the cooked pasta. Stir well and coat the pasta with the garlic oil and pasta water sauce. Heat off. 5) Transfer the pasta to a plate, Add some grated parmesan and a drizzle of oil before serving. A simple homemade Italian meal that we never get tired of in this house. :) We served our meal with a side of greens and some fresh lemonade.